This summer, Birthright Israel: Mayanot will offer its first trip specializing in the vegan diet and lifestyle. 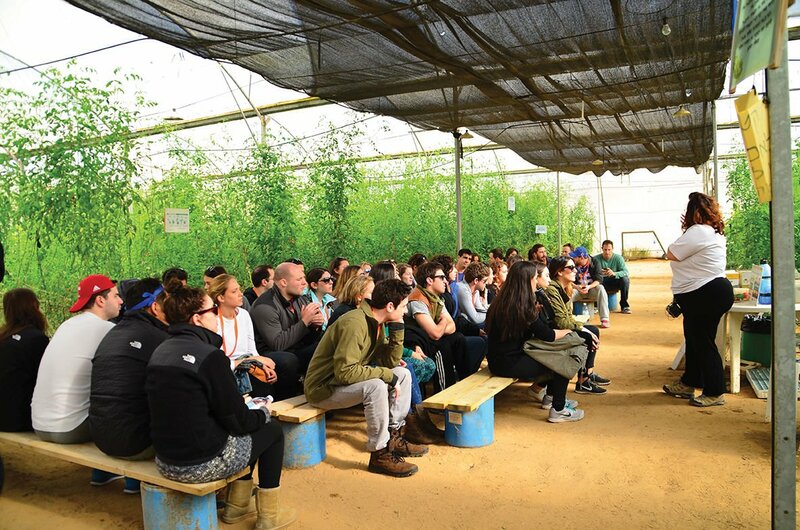 A Birthright Israel: Mayanot group learns about innovations in vegetation in Israel. For the first time in its nearly two-decade long history of sending young Jewish adults to Israel for a free 10-day immersive cultural experience, Birthright Israel: Mayanot will be offering a trip specializing in the vegan diet and lifestyle. The announcement was made by Mayanot’s partner in this endeavor, Jewish Veg, last month. Registration is open now for the trip, which takes place Aug. 13-23. Space is limited to 40 slots, 10 of which are going to vegan young adults in Israel, “adding to the experience,” according to Jewish Veg’s press release. Along with traditional Mayanot activities – among them spending Shabbat at the Western Wall and climbing Masada – the forthcoming vegan trip will include a uniquely tailored diet as well as meetings with vegan leaders in the nation state and visits to specialty farms. “I give Mayanot a ton of credit for recognizing this was an unmet need,” said Jeffrey Cohan, executive director of Jewish Veg, a more than four-decade old nonprofit whose mission is to help people internationally transition toward a plants-based diet via the ideals of Judaism. Cohan, based out of Jewish Veg’s office in Pittsburgh, Pa., referred to the trip as long “overdue” for two principle reasons. Though Mayanot already offers specialty diets – vegan, vegetarian, gluten-free, etc. – to those taking the organization’s regular trips to Israel, Cohan believes that the culinary component of veganism is only one facet of a larger movement that needed to be better catered to. To illustrate his point, Cohan referenced the proposition that many vegans would object to the thought of a camel ride, a typical activity on Mayanot trips through Israel. Margolin, who said the idea of an exclusively vegan trip to Israel had been in the works for a little more than a year before the announcement was made, said other singular activities for those onboard will include vegan shopping at local markets, cooking classes and hearing from religious leaders about the aforementioned vegan lifestyle. Rabbi Fred Scherlinder Dobb has been the spiritual leader at Adat Shalom Reconstructionist Congregation in Maryland for the better part of the past two decades and is also a member of the Rabbinic Council of Jewish Veg. Although he is not directly involved in Jewish Veg’s partnering with Mayanot on the vegan trip ahead, he is very excited by the notion and the impact he hopes it will have on Jewish youth. “My primary commitment is to creation and the environment as a whole,” said Scherlinder Dobb, who confesses to being vegetarian though considering the vegan lifestyle at some point himself. “I am mostly in this because of the simple reality that eating low on the food chain is vastly more sustainable for the global climate and for our grandkids,” Scherlinder Dobb said. Though Scherlinder Dobb is of course well aware that it’s difficult for a young person (or anyone else) to turn down a free trip to Israel, he believes Mayanot’s vegan trip will help people who may have other life priorities – such as this animal and environmental advocacy he feels is so essential to the overall Jewish experience – to see going to Israel as a priority in their busy lives as well. “I think it is important that Jewish young people will have the opportunity to enjoy this trip without worrying about their food containing animal products or their activities [involving] animal exploitation,” wrote Ori Shavit in an email from her home in Israel. Shavit is an integral part of Jewish Veg, which brings the food journalist and highly regarded leader of the vegan movement in Israel to America through a partnership with Hillel twice a year to speak about veganism. For more information about Birthright Israel: Mayanot’s vegan trip to Israel and other trips, visit: mayanotisrael.com.